Nicknamed the "Mile-High City" because its official elevation is one mile above sea level, Denver is the largest city and the capital of Colorado. Denver is the second most populous county in Colorado, after El Paso County. Located in the South Platte River Valley on the western edge of the High Plains, the city has an area of 154.9 square miles, of which 1.6 square miles is water. Denver has also been historically known as the Queen City of the Plains and the Queen City of the West, because of its important role in the agricultural industry of the high-plains region. Several US Navy ships have been named USS Denver in honor of the city. Denver Colorado Zip codes: 80012, 80014, 80110, 80111, 80123, 80202, 80203, 80204, 80205, 80206, 80207, 80209, 80210, 80211, 80212, 80214, 80216, 80218, 80219, 80220, 80221, 80222, 80223, 80224, 80226, 80227, 80230, 80231, 80232, 80235, 80236, 80237, 80238, 80239, 80246, 80247, 80249, 80264, 80290, 80293, 80294. Where Denver now stands, there were originally three separate towns. In 1859, the other names were dropped in return for a "barrel of whiskey" to be shared by all and the first permanent structure in Denver was a saloon. In its first few years, Denver was destroyed twice - once by fire and the second by flood. Denver legend and lore says the first permanent structure in Denver was a saloon. According to The City and The Saloon (book), during Denver's wild ride from frontier mining town to twentieth-century metropolis, the city's saloons, like those of many other western frontier towns, played a vital role in the development of the city. There were numerous saloons in the Denver area during the city's early day and ironically, bear brewing today is a big business in Denver and the state of Colorado as a whole. Denver has been nicknamed "the Napa valley of beer," only it's unclear how this nickname came to be. Referenced by the Denver Business Journal, this nickname was created by the Sheraton Hotel chain as part of their "Chief Beer Officer" promotion in 2008. However, it seems to have stuck. Denver has an arid climate and actually gets only 8 to 15 inches of annual precipitation and more than 300 days of sunshine and blue skies. Winters are mild with an average daily high temperature of 45 degrees. Since the snow rarely stays on the ground for long, golf courses and outdoor cafes stay open all year round. During the summer months, Denver has relatively low humidity with the average daily high around 86 degrees. The mild weather is due is due in part to it's "mile high" altitude (5,280 feet above sea level). If you are currently looking to buy Denver Real Estate or thinking about relocating to the Denver area, you will find many residential options to choose from. Whether you are looking for Denver luxury estate homes, properties with mountain views, single-family homes, town homes or condos, we are experienced Denver Realtors® that can help you find the right home to fit your lifestyle, preferences and needs. The median home value in Denver, CO, is $342,500. Home appreciation is 12% over the last year. The median age of Denver, CO, real estate is 48 years. Renters make up 46.04% of the Denver population and 7.94% of houses and apartments in Denver are unoccupied (vacancy rate). 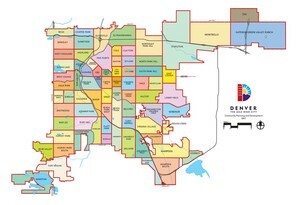 Denver is the center and the most populous city of the Front Range Urban Corridor, an oblong urban region stretching across 18 counties in two states. Denver is the most populous city within a 500-mile radius and the second most populous city in the Mountain West and the Southwestern United States after Phoenix Arizona. With a population that is 40% Hispanic and 10% African American, Denver is a dynamic city of diverse cultures. As of 2012 Denver's population is 600,158 with 3,923 people per square mile (population density). The median age is 33.8. 36.72% of people in Denver are married and 13.56% are divorced. The average household size is 2.22 people. 30.29% of people are married with children and 16.63% have children, but are single. Denver's economy is based partially on its geographic position and its connection to some of the major transportation systems of the country. Denver has a considerable government presence, with many federal agencies based or having offices in the Denver area. Along with federal agencies are companies based on US defense and space projects. More jobs are brought to the city by virtue of its being the capital of the state of Colorado. The Denver area is home to the former nuclear weapons plant Rocky Flats, the Denver Federal Center, the Denver Mint and the National Renewable Energy Laboratory. The unemployment rate in Denver, CO, is 8.90% with job growth of 2.00%. Future job growth over the next ten years is predicted to be 35.10%. Denver sales tax rate is 7.72 % and income tax is 4.77%. Denver is served by Denver Public Schools. Denver schools spend $4,415 per student. There are 19 pupils per teacher, 551 students per librarian, and 713 children per counselor. Sports (Denver is one of only two cities in America with eight professional sports teams). The City and County of Denver boasts having over 200 city parks, over 100 miles of trails, and 11 dog parks. Denver Parks are open from 5:00 am until 11:00 p.m. year round. The Denver Mountain Parks are a natural, scenic and historic destination in the foothills west of Denver. Regional Transportation District (RTD) - Public transit for metropolitan Denver/Boulder. Denver is severed by the Denver International Airport, a major airline hub and the fifth busiest airport in the United States. We offer years of experience in the home buying process, focusing on Denver communities within Denver County. Give us a call today for a list of Denver homes for sale currently available in your area of interest. If you are thinking about selling your Denver home, we have extensive training in cutting-edge, online marketing technologies for today’s competitive real estate market. The first step in the home selling process is to provide you with an in-depth comparative market analysis (CMA) on your home. We will then create a comprehensive online game plan to get your Denver real estate in front of as many qualified buyers as possible and get it sold as quickly as possible! If you need to sell your home now and are under water, or behind on your payments, We can help! Through our experience handling Denver distressed properties, we have found that homeowners today have more questions than answers about their circumstances and what to do. Our expertise in the Denver real estate market will benefit you whether you are looking to buy or sell a home in the area. Please give us a call, send us an email or fill out the online contact form, and let us know how we can assist you with your Denver real estateneeds. We look Forward to speaking with you!